My father was in the air force in the Second World War. And my mother was a physiotherapist in the Army. They met on Borneo in 1945. There was a whirlwind courtship for about two weeks before Mum was sent back to Sydney and Dad forwarded on to Japan to cover the Occupation of Japan. By then my dad was a war correspondent for The Sun newspaper. That was in August. 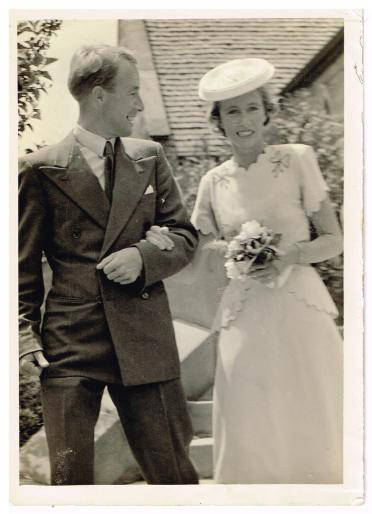 Dad was back in Sydney six weeks later, proposed and they were married on 20th December 1945. I’ve known that story all my life. Just writing it down leaves me with a lump in my throat. My parents loved each other, totally, till they day they died. What a wonderful story. No wonder I’m hooked on romance. This Anzac Day there has been a lot of talk of sacrifice, and patriotism and sad stories of young men marching to their death. This was a good one. My father finished up a Wing Commander, which gave him the opportunity to see his own records. On his induction papers there was a definite remark underlined – Not officer material – which he relished telling us kids later. There was a lot of joking and funny stories, but he never attended an Anzac Day March. There were a lot of men, to whom the experience of war was something they didn’t talk about. Mates made during this time were mates for life. It went a lot deeper than most were able to express. War made a huge change to their lives. But they saw the world, many found opportunities they never would have got at home, met people they would never have ever been introduced to in a normal world. It mixed classes, upended social norms that had been quite strict before the war. This entry was posted in Uncategorized and tagged ANZAC Day, love story, romance, veterans. Bookmark the permalink.